Managed to get two together in 121 lower , Lansdowne Road entrance well happy , can’t wait !. Rooster, any truth to the rumour BLOCK 121 had a 5% discount offered on Family Tickets if your Surname is Cooney, Murphy, Moore, Shanahan, O'Connor or Timoney....? The center of Bordeaux is starting to get booked out for the possible semi final aswell !. footrush wrote: Managed to get two together in 121 lower , Lansdowne Road entrance well happy , can’t wait !. No problem with that Rooster bring my Ulster Rugby fleg I collected as a souvenir from the terrace in Leicester a few weeks ago !. rooster wrote: [quote="footrush"]Managed to get two together in 121 lower , Lansdowne Road entrance well happy , can’t wait !. mildlyinterested wrote: So no Toner. Are we not due Luke back by then? If so I’d be very tempted to get Lowe on the pitch at 11 and I wouldn’t be in such a rush to put SOB in at 7 ahead of VDF. To be honest the way this six nations is going I’m expecting a few injuries to at some of the above. At least we've had him once already this season I suppose. Ulster haven't I think. Didn't think Romaine was an option for Ulster after the 29th March? LeRouxIsPHat wrote: Didn't think Romaine was an option for Ulster after the 29th March? Ruddock out injured now too, unclear how long. mildlyinterested wrote: Ruddock out injured now too, unclear how long. Can SOB still play 6? Yep. 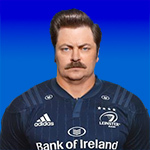 Will he be healthy come end of 6 nations? Unlikely but I can dream. If he's not we'd probably be looking at Molony in the second row and pushing Fardy out to 6, or Deegan at 6/Conan at 6 with Deegan at 8. None of which would inspire confidence.